I'm still trying to catch up from all the fitly spoken words from Relevant this weekend. It was phenomenal. God met us there. Absolutely perfect -- you can just hear the crunch of those apples. And what a perfect verse on a day when I've been tired, fighting allergies, faced with a long to-do list -- my words are so influential and powerful, whether good or bad. A wonderful portrayal of that verse! 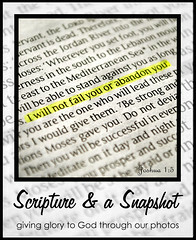 Beautiful photo and appropraite verse. I can't believe I spelled 'appropriate' wrong, also. I need to go to bed now. Nite-nite. Lovely picture to go with such a powerful verse!!! I am so glad you had a good time at the conference. I have been reading so much about it the last few days. WOW!! Such a beautiful verse! So, so true!! 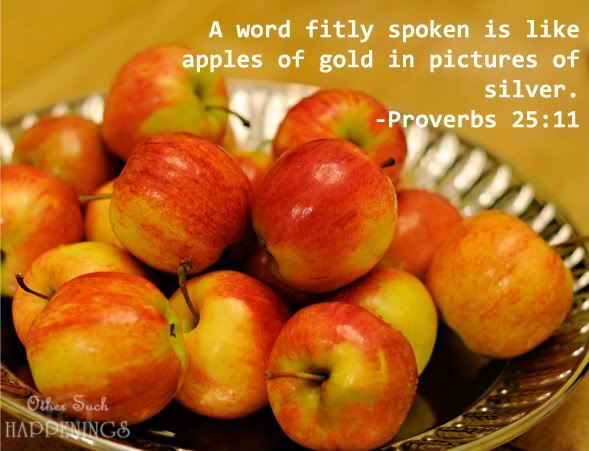 The words we speak have impact, be it negative or positive. Sorry for the deleted comment... I thought I sent it twice. Oops! Anyway, great image!! Miss you already, are you as tired as I have been?